TopicDeletionManager is created exclusively when KafkaController is created. TopicDeletionManager is controlled by delete.topic.enable Kafka property and does nothing when it is turned off (i.e. false). TopicDeletionManager uses [Topic Deletion Manager [brokerId]] as the logging prefix (aka logIdent). Enable INFO logging level for kafka.controller.TopicDeletionManager logger to see what happens inside. TopicDeletionManager initializes the internal registries and counters. 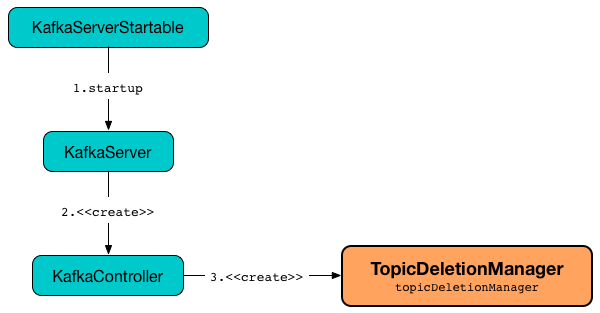 (only with delete.topic.enable Kafka property enabled) markTopicIneligibleForDeletion computes the intersection between topicsToBeDeleted and the input topics sets and adds the intersection to topicsIneligibleForDeletion set. reset does nothing when delete.topic.enable Kafka property is false. reset is used exclusively when KafkaController resigns as the active controller.